Disk'O - combines a breathtaking dual rocking/spinning motion with an all-new seating style where everyone gets a front-row seat! Rim Runner - intensely wild, wet and wacky! Don't let the gentle ride up a sparkling stream fool you. Brace yourself to drop down a fast and furious 60-foot waterfall! 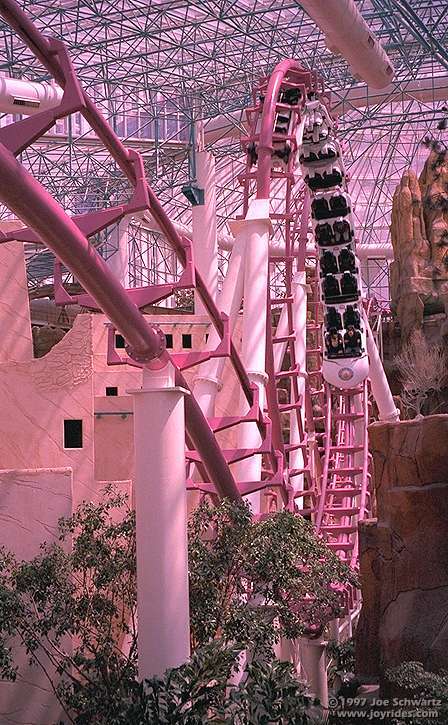 Chaos - ultra-thrill ride will whirl you in three ranges of motion with a speed and intensity that warrant a totally unpredictable experience every time! Inverter - Endless flipping at mind-blowing speeds. 360 degrees of constant g-force action. Cyber Speedway - the most heart pounding and realistic simulated race car driving experience in the world with NASCAR and Indy vehicles. 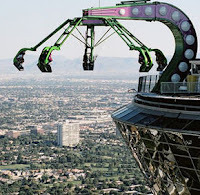 Big Shot - Shoots passengers straight up 160 feet at 45 mph (over 4 Gs) until they are 1,081 feet above the Strip. 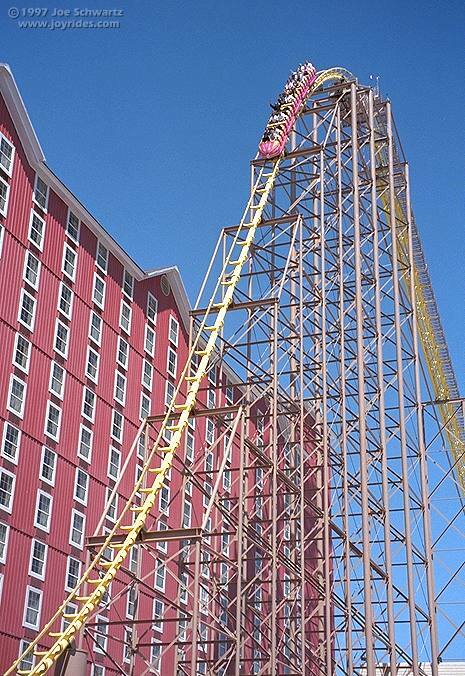 X-Scream - A giant teeter-totter that propels you 27 feet over the edge of the Tower, 866 feet above the ground. Observation Deck - for thoes who drive 20mph under the speed limit. 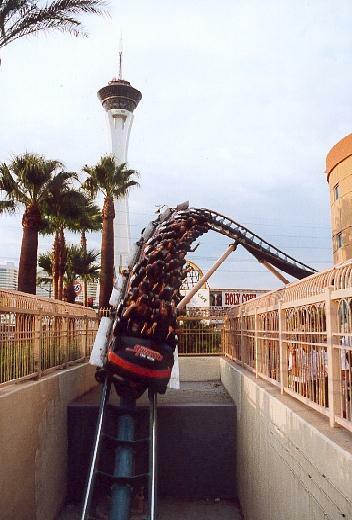 High Roller - closed in 2005 to make way for some of the above attractions. It was a roller coaster with a max speed of 30mph and max dropof 30ft that went for 2 minutes around the top of the tower. Manhattan Express - Track length: 4777Ft. Max Height: 203ft. Max Drop: 145ft. Max speed: 67mph. Duration: 2 min 45 sec. 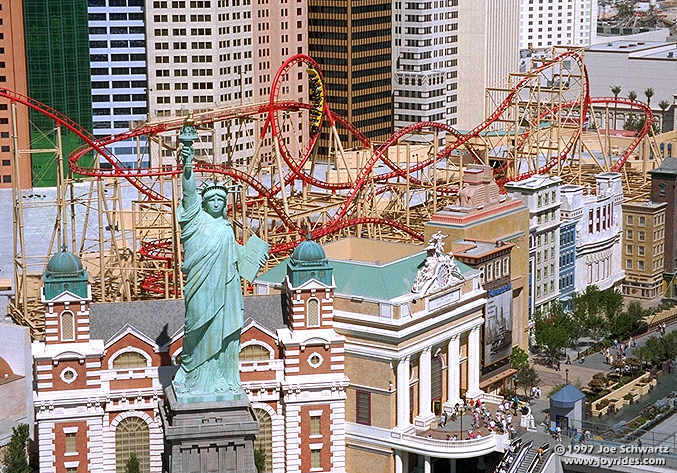 You can even get married on this coaster - yup, this is Vegas! Buffalo Bill's Resort - This resort is located 48 miles southwest of the Vegas Strip on the California/Nevada state line - a 40 minute drive from Las Vegas. Turbo Drop - Straight down, from 170 feet in the air, at an intense 45 miles per hour! Experience negative one G, and then 4.5 Gs of force. Go ahead, take the plunge! Adventure Canyon Log Flume - swirling rapids, treacherous water falls and target shooting with state-of-the-art laser light pistol. Maxflight Cyber Coaster - Forget amusement park lines; take your choice of high-flying fun from coasters all around the world.